Sport: What is meant by organisation structure? What is meant by organisation structure? An organisation's structure is the manner in which the workforce of the organisation is organised into specific job roles and responsibilities to undertake work to accomplish the organisation's mission. Another way of looking at organisation structure is to think about the total of work that is done by the organisation and then to envisage that this work must be divided up among the workforce in some manner. One common method by which the total of work is divided up is according to business function. In a manufacturing company, for example, business functions might include Production, Marketing, Sales, Administration, Maintenance, Human Resources, etc. Then people are employed at various levels to ensure each function is carried out. There are multiple ways an organisation can be structured to accomplish its mission. Factors to consider in developing an organisation structure include: type of organisation (profit business or non-profit organisation), scale of operations (large, medium or small), key business functions and business philosophy. The above diagram illustrates that there are three important layers of the structure. 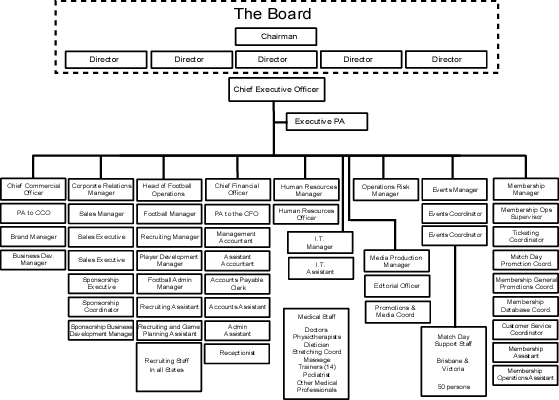 The top layer of the structure is the Management Committee (or Board of Management). This is the body of people who have the ultimate authority within the organisation. All people who are part of the management committee are elected and the key positions are President, Vice-President, Secretary, Treasurer. It is common for all persons on the management committee to be volunteers, that is they are not paid to do the work they do. The next layer is the salaried officer of the organisation. In the above diagram there are only three people who are salaried (i.e. paid for the work they do) and they are the Executive Director, Development Officer and Coaching Director. This just an example. Many smaller non-profit sport organisations have insufficient funds to be able to employ anyone. Other sport organisations which are much larger may have a great many employees (as per the organisation structure of a major football club below). Although the management committee have ultimate authority, it is the salaried officers that carry out most of the important work, and that is why they are paid. The lowest layer in the above diagram is the very many people who perform voluntary roles. These voluntary roles may involve just 2-3 hours of work per week. 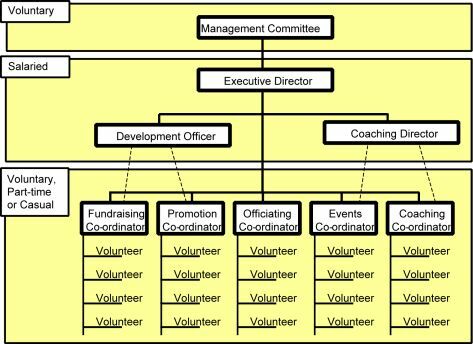 In a sport organisation, this level of the organisation structure would include people who coach and officiate, raise funds for the organisation, help with the events, run the website, look after the club's facilities and run the club's canteen. It is important to understand that the manner in which work is divided up among the people of the organisation is purely arbitrary. There will be differences between similar organisations. Different organisation structures suit different types of organisations. The organisation structure of a non-profit organisation can be very different to a for-profit organisation. Some more examples of organisation structures can been seen below. 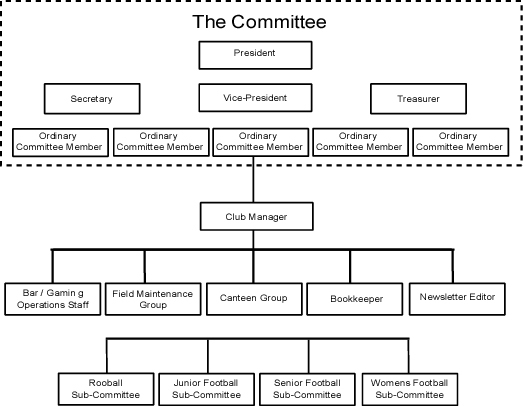 The organisation structure of a major football club depicted below was drawn from a real example. There is no perfect solution to developing an organisation structure. There is always change and therefore organisation management must review the structure of the organisation and modify as necessary. Some factors that impact on organisation structure are listed below. An organisation with a mission to provide service will be structured differently to an organisation that exists primarily to sell products.An organisation that is a non-profit organisation will be structured differently to an organisation that is a for-profit business. Managing an organisation is about dealing with the problem that there is always too much to do and too few staff to carry out the work. Management must determine which tasks are most important and assign personnel to them. Therefore the organisation structure will depend on what decisions have been made by management with respect to priorities. Statements of "Goals" and "Objectives" represent what the organisation wants to achieve. They change from time to time as a result of the changing environment in which the organisation lives. As Goals and Objectives change so will the organisation's structure. Organisations cannot solve problems by simply employing more people, if only this was the case! The number of paid people in an organisation is limited by the availability of funding. Even when organisations rely on volunteers, the need for money does not subside.